Quick Links: What switches you usinng for your LED light bar? TRD pro wheels, how to keep clean?!?? 4 Wheel Drive emblem Trd pro rim 255/75r17 for limited spare Cargo basket size? Any one running the Vanguard bill bar? Getting a 5th Gen 4Runner SR5 soon, and I plan to run a C4 Lo-Pro front bumper and a synthetic roped Smittybilt winch. I also plan to run Rocky Road Rock Super Sliders, which are about 90 lbs. Also plan to run 255/75/R17 KO2 Tires. What are some good options for leveling the front end, that will also handle the weight well? I know alot of people run the Bilstein 5100s up front, and with the added weight, probably set them to the 1.85" position? But, that would still be on stock coil springs, will they handle the added weight well? Or am I going to have to jump up to a much more expensive option, like the ToyTec Ultimate Coilovers? Hoping not. But far less rake than factory. I put on Blistein 6112 set at second circlip for an 1.4” lift with KDSS. I added a X20 Smittybilt with synthetic and a Greenlane aluminum bumper and sliders along with RCI full skid aluminum. I sit pretty much level. The Blistein have new coils and a larger bore strut. WallyT4R, jgcaps and Strandskov like this. I figure your aluminum bumper is about 30 lbs or so lighter than the C4 Fab bumper. You have the most rake I would want, slightly more than I want maybe. I saw the 6112s mentioned before in another thread, but didnt realize they were also a stiffer spring rate. Looks like they also have more adjustment grooves, so more options to get it dialed in, level wise. Least those are almost $300 cheaper than the ToyTec option. Im not looking to go cheap, but at the same time, well, you know, stuff adds up quick. The Greenlane bumper comes in at 43lbs. If I had to do it all over I probably would go up one more notch to put it at 1.7”. Though I am not hating the 1.4”. I figured once we load it up with camping equipment and a couple hundred pounds of dogs it will sit level. Just adding shocks that increase the preload to level out the vehicle does not help you carry more weight. Springs carry the weight. Shocks dampen the weight. To carry more weight you need to increase the spring rates. Have you looked into a standard OME setup? The only OME setups I saw were complete lifts, that looked to be 3"? and like you say, the front coils will need to be replaced, which I figured was the case, just wasnt sure what options were out there. Plenty of options for more involved, expensive and taller lifts, but wasnt sure what people were doing for mainly leveling with additional weight. Thanks I will look into the OME more. Ran them on TJs in the past and liked them. Shame it doesnt have adjustable height like the others though. Strandskov and eaglescout like this. I would look into the Eibach pro truck kit as well. We have installed numerous and everyone has been happy. 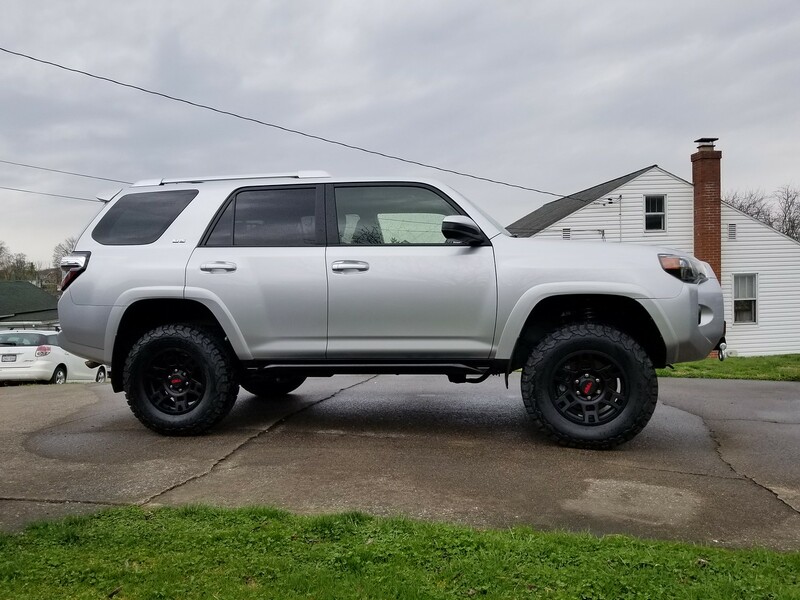 Unless I am missing something, the Eibach 4Runner springs say they are 2.75" lift? Way more lift than I need to run 255/75R17s. Plus I dont want to go over 2", so I dont run into alignment issues and need to swap out upper or lower A arms. You could get the Eibach shocks and set them at the 1.6" setting. Ask Eibach if they have any coils that are stock size that will handle the additional weight you've added. They might have something. I have these shocks with stock coils (no additional weight) and I'm very happy with the ride. This is the Pro truck kit installed on a new 4Runner with stock uppers it aligned just fine. scottalot, jgcaps, WallyT4R and 2 others like this. Has a nice stance to it, what size tires are those? It looks a tad higher in front. Wondering what happens when you load it up in back. After my bumper and winch my front sagged. I had to take my king coilovers and replace with 700lb King springs to get the rig back to level. Wheelers offraod carrys them. Do you remember what notch setting you set the front shocks to? Love the stance of this, but with the added weight of bumper and winch, Im betting I might need to set it one notch higher than you did. 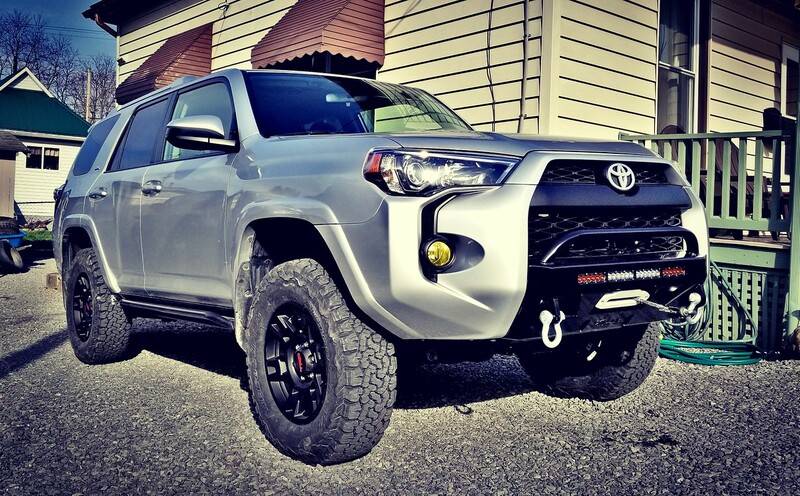 Have you installed this kit on any 4Runners with bumper and winch? And just to confirm, you are talking about this kit, correct? I have a 3” lift, but toyotech works amazing. I hear alot of good things about the Toyotechs, but thats more lift than I want, or need, dont want to get into replacing control arms, etc. I will just be running 255/75/R17 tires. Read in another thread the Eiback springs are 660 lb/in. front and 205 lb/in rear. Fronts are set at zero. I would put it up one notch. We have used these on tacomas with bumpers and a winch but not 4runners yet. Yes that is the kit. We sell it as well. Right toytech offers a 650lb and 700lb as do most companies. 700 may hold the weight better than a 660lb. Also if you want to add more weight in the future 700lb is the way to go. This, put the whole kit on could not be happier. Summit bumper and Smittybuilt with rope. Front clip set on second ring. Got rid of the body roll and nose dive when braking, rides tons better and handles so good you can feel the rack and pinion steering! WallyT4R, nimby and scottalot like this. Thanks for the input, been wanting to hear from someone that has this kit AND some bumper/winch weight up front. Setting it to the second notch is what I have been thinking would work out well. My bumper will be a bit lighter, but still looks like it should work out well. nimby, SlvrSlug and WallyT4R like this. Very nice! I just bought the same kit but since I will be carrying 300-500 lbs on a constant basis and towing a trailer often, I purchased a stiffer OME rear coil per recommendation from Wheelers. The OME rear coil is 265 lbs vs the stock Eibach at 205. I will have a rake but this better suits my application. Do you feel the need for upper control arms? I'm thinking about just going ahead and getting a set. Also do you have a diff drop or think it needs one? WallyT4R and nimby like this.